It was another, very different HBO show that mused: “Time is a flat circle.” However, last night’s season eight premiere episode of Game of Thrones felt quite cyclical in its storytelling. The first episode of the final season mirrored the first episode of the first season. Once again, we are in Winterfell watching a blonde-haired queen roll into town. This time, it’s Danny instead of Cersi, but she’s still someone the insular community of Winterfell doesn’t trust (and someone who is having an affair with a blood relative, though in Danny’s case it’s unknowingly). It’s an episode filled with reunions and nods to the past – some overt and some more subtle. We also had people (like Danny and Sam) meeting for the very first time. As our characters approach the story’s end game, they are grouping in Winterfell and King’s Landing, choosing sides as we gear up for a final battle for the Iron Throne (or perhaps, a final battle between the living and the dead). It felt like the writers wanted to use this episode to both reintroduce us to this world and to give a more lighthearted moment of calm before the coming storm. While I completely understand this mentality, I was a bit put off by the lighter, jokier tone of the show. It felt like a very different world than the one I’ve been watching for the past eight seasons ; one where everyone was more Tony Stark than Sansa Stark. Jon: What do I hold onto? 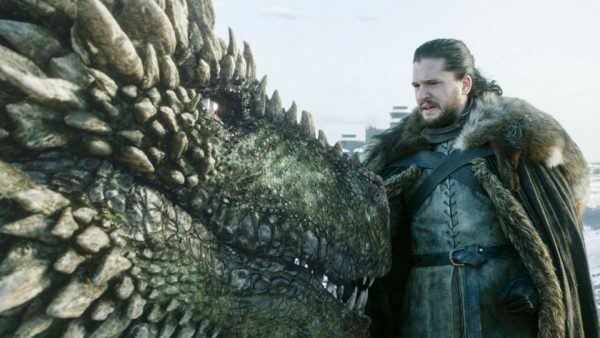 These conversations are snappy and clever (and would be right at home in Joss Whedon’s Avengers films), but they feel out of place in Westeros. Not only do they feel way to quippy for this normally more somber, weighty universe, but they involve characters asking very legitimate questions and being met with vague, unhelpful responses. (I’ve dealt with a lot of trauma over the past few years, Jon, so please assure me you aren’t some sort of zombie! or That’s funny, Danny, but seriously, tell me how to not fall to my death while riding this giant, fire-breathing monster!) Again, these types of exchanges work in a broad action movie, but that’s not how more grounded characters like the ones in Westeros interact. There were a few moments of comedy that felt more at home in the world (like Sansa’s remark to Jon about Danny being pretty) that felt more organic and true to the characters, but overall, I found these moments really distracting. While the broader comedy didn’t work for me, I really enjoyed the episode’s quieter moments. John Bradley, in particular, was a standout for the way he played the wave of emotions Sam felt as he learned that Danny killed his father and brother. (I was particularly moved seeing how much harder his brother’s death weighed on him.) Sansa, who has often been sold out by the writers, felt like a much needed voice of reason for Jon. Cersi, being Cersi, always works for me as well. And Bran was an MVP in his stoic “We don’t have time for this nonsense” vibe, which contrasted well with his willingness to sit and wait for hours just so he could stare down Jaime Lannister when he arrived. Overall, it was an episode I wasn’t particularly invested in, but hopefully it was a necessary one that helped to set the table for things to come. I’m curious about the Night King’s avante-garde art installation and I’m curious how things play out now that all of our various factions have assembled together. Jon now knows about his true lineage. But I have trouble seeing how he uses this info to his advantage. Neither Cersi nor Danny is likely to be swayed by his claim to the throne and it will be difficult to definitively prove anyway since it relies on one book Sam read in the Citadel and Bran’s oracle powers. Speaking of Bran, he presumably knew that Jon and Danny would sneak off for a little dragon ride quickie, so it was pretty cold to wait to tell Jon he’s related to Danny until after that moment. I wanted to be excited about Theon saving his sister, but that felt like such lazy writing to just hand wave past all of the improbable parts of the rescue plan to just skip straight to her being free.